2Asist. Dr., Sağlık Bilimleri Üniversitesi İstanbul Eğitim ve Araştırma Hastanesi, Göz Kliniği, İstanbul, Türkiye Purpose:<7b> To evaluate the complication rate of cataract surgery in patients treated with tamsulosin due to benign prostate hypertrophy. Materials and Methods: The medical charts of 63 eyes of 38 patients treated with cataract surgery retrospectively and patients treated with tamsulosin due to BPH were included in the current study. The demographic characteristics of patients, intraoperative complications rates, usage of iris hooks were recorded. Results: The average age of patients was 76,8±5,5(64-85). All patients were male. Floppy iris syndrome occurred in nine eyes (14.2%). 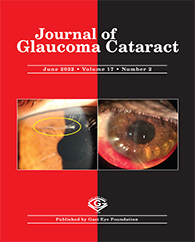 Intraoperative posterior capsular tear was existed in three eyes (4.7%) and the intraocular lens was implanted in the ciliary sulcus in these three patients. Because two eyes (3.1%) complicated with zonular dialysis, intracapsular cataract extraction was performed without an implantation of the intraocular lens. The vitreous loss was occurred in four eyes (6.3%) due to posterior capsular tear and zonular dialysis, an anterior vitrectomy was performed for treatment of these eyes. Iris hooks were used in two eyes (3.1%) because of fl oppy iris syndrome and pupillary miosis.